ASPEN – Lightness and grace personified, his style was as distinctive as Hemingway’s prose. The delayed, or “counter-rotated” shoulder technique, legs pressed together, gave the impression of making a single track. It defined skiing elegance for more than a generation, starting in the 1950s and continuing through the 1960s. “He is the most stylish skier I’ve ever seen,” says Magne Nostdahl, who was one of Stein’s core Norwegian team in Aspen. He now lives in Carbondale. Stein was also a freestyle pioneer. Arms outstretched and suspended in mid-air, he would hold a swan dive just long enough to startle, and then tuck into a somersault, landing with the ease of a bird. The move seemed to transcend the sheer physicality of the sport, imbuing it with something greater than itself. Skiing and risk, as a way of life. But what makes Stein remarkable is the man himself, not just the skier. “Stein is one of the few Olympians who has kept their name in front of the public,” says Inger Gernon, Stein Eriksen store manager (now Gorsuch as of December). For him, that goes back to 1952, when he took a gold in the Olympics. 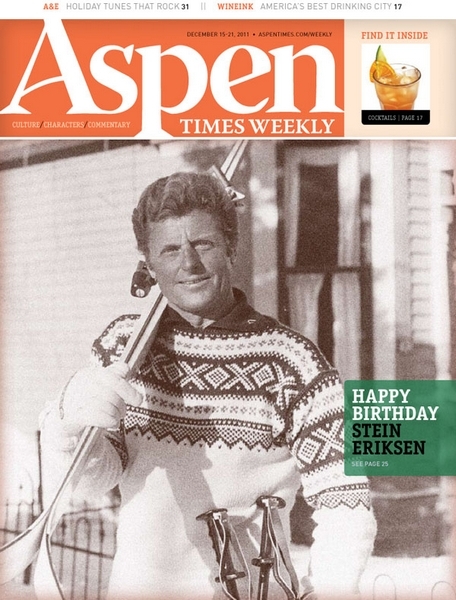 As we celebrated his 84th birthday this month on Dec. 11, we look back on the origins of a life of skiing. Skiing is as much a part of Stein’s DNA as his heritage. It’s only fitting that he hails from a country where remnants of skis have been found in peat bogs, dating back thousands of years. Stein grew up near Oslo’s skiing “shrine,” the Holmenkollen. He was exploring on cross-country skis before he could read. His parents were athletic: his mother started the first women’s alpine club in the 1930s, and his father was a cross-country skier and member of the Norwegian Gymnastic Team that competed in the 1912 Olympics in Stockholm. He had tips and theories about being a star athlete from the very beginning (he believed to be a great skier one had to use a sauna bath two to three times a week; hence, the homemade sauna in their home). Stein followed suit, first becoming a gymnast, gleaning invaluable training techniques and a foundation that was invaluable for the burgeoning alpine skiing Olympian. He would be the first skier from outside the Alps to win an Olympic men’s alpine gold and a silver in slalom in the 1952 Winter Games. A few years later in 1954, he won three more gold medals at the World Championships in Are, Sweden, making him the first alpine skier in the world to win a triple gold at a world championship. The victories would change the course of his life. Doors opened. America called. He was now billed as a sort of “celebrity” ski instructor and was invited to a succession of resorts, beginning with Michigan’s Boyne Mountain. Boyne Mountain founder Everett Kircher offered him $5,000 by telegram. “I told the coach [of the Norway National Team] that the time had come to make a living, and so I got his blessing to accept. I sent a return telegram saying, ‘Accepted if you double it.’ It was a hell of deal,” Stein recalled. He then moved on to Heavenly Valley, California, Vermont’s Sugarbush; and Aspen and Snowmass in Colorado, where he taught his signature style before moving to Deer Valley in 1981. At the encouragement of developer Edgar Stern (of Aspen’s Starwood, Aspen Country Day School) they became business partners in Deer Valley. Stein would lend his name to the eponymous five-star luxury ski lodge, which opened the following year. Today he acts as host and is director of skiing for Deer Valley Resort. Hilary Stunda: It’s been said that as you rounded the gate for your first gold medal run, your body was entirely off the ground. But by placing your fingers on the snow, you recovered your balance and were able to win … seems like quite a feat. Stein Eriksen: Gymnastics was the base for my success in alpine skiing. Because the Germans, Austrians and Swiss are more rugged people in a way, they did a lot of mountain climbing, demanding more physical effort. I had a gymnastic background that made me more of an athlete than a mountain climber. That gave me more movability and different maneuvers to come through the course. I was measuring what the European track looked like in the slalom course. I ran the same combinations and realized I could maneuver the shorter track coming down the mountain because my physical ability was a little more flexible and athletic than a mountain climber. HS: I spoke with Bente Godal, one of your Scandinavian posse who came to teach for you in Aspen. She recalls first meeting you at a summer training camp on the Glacier Stryn, in the Fjords. When was this? SE: I was in my late teens, early twenties, before I started racing internationally. We trained in the summertime, up on the glaciers, while the Germans were occupying Norway. As the years went by, more people did it. In the wintertime, the Germans wanted us to participate with them, but we didn’t want to. So we did our own little training, illegally, where they couldn’t disturb us. HS: It sounded amazing. Big bonfires, skiing into the lake. HS: Is that when Willy Bogner lived with your family? SE: That was before the war. He was an alpine skier from Germany. Father was a nordic champion and ski-jumping champion and Willy Bogner wanted to learn about nordic skiing. They became friends. They exchanged ideas. Willy became father’s adviser to the first manufacture of alpine skiing in Scandinavia. He introduced alpine skiing to Norway. It’s probably the reason I became a champion alpine skier. HS: How long did he live with your family? SE: He lived with us off and on for ten years. We couldn’t meet during the war. He fought for his country; we protected our country. After the war, we could meet him again. There was no animosity there. He was a German. He had to fight for his country. HS: Skiing is more than just a sport for you – it’s really a way of life. How did this philosophy evolve? SE: I couldn’t avoid it. Mother and father had the same philosophy. Everybody that came through our house, whether ski jumping, cross-country, gymnastics … it was always sporty people that came through my house. I knew then, that’s the kind of life that I want to live. That’s the way I was brought up from birth on. I only had a sporty attitude. And only sporty friends. HS: How early did you begin? SE: When you first started school if you wanted to be on the team, you had to be a cross-country skier or a ski jumper; otherwise you had nothing to do. HS: And now, at age 84, looking back, what stands out? HS: The Norwegian invasion lives on! HS: Do you miss your homeland? SE: I never became an American citizen because after all, my races for Norway and the acceptance I had by the Norwegian public, I can never say Norway is not my country anymore. I kept my citizenship, and I will do that until I die. HS: Any regrets, things you wish you had done? SE: No. I’d just like to do it all over again. When you end up in competitions and end up on top, blessed by God or parents, and then you end up healthy at the age of 28 and you have the rest of your life in front of you, and they all approve of you and the way you inspire people. … When I came to America there were maybe one and a half million alpine skiers in this country. Today there are about 18 to 20 million. If I can take a little credit for what has inspired people by my background and my presence … what can you say?